EU Council President Herman Van Rompuy has warned that the EU is in a serious crisis over the financial crisis in the eurozone with the debt problems as the economic health of member states such as Ireland, Portugal and Greece come under new scrutiny. Van Rompuy said that all EU member states must work together in order to survive the eurozone, that's the member states that use the euro as currency because if the eurozone does not survive, then the EU will not survive. As the EU faces an economic crisis that could bring down the union itself, there are signs that this situation could set the stage for Bible prophecy to be fulfilled. For a number of months there has been a developing situation in Europe that could have ramifications which will affect the entire world. The economic crisis now affecting many EU member states including Greece, Italy, Portugal and Ireland has brought the eurozone to the brink of collapse. Financially strong European member states like France and Germany have been doing all they can to prop up the eurozone, realizing that if the euro fails, so could the entire political structure of the EU. 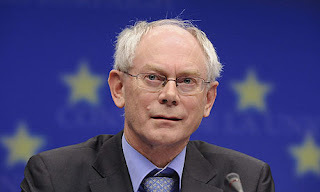 EU Council President Van Rompuy confirmed that fear in a recent statement to the EU leaders. The possible collapse of the EU would affect our world politically, economically and prophetically. I say prophetically because a close study of the prophetic scriptures reveals a major economic, political power that will come to place in what was the area of the old Roman Empire; and the EU does indeed match that prophetic scenario that can be found in Daniel 7:7-24. For centuries, leaders in Europe have been trying to revive the old Roman Empire. All have failed and the EU seemed to be the best chance for this prophecy to be fulfilled. Remember, Bible prophecy is not totally dependent on current events, because as we see, these current events change from day to day. However, I must remind you that the end time scenario found in God's Word will come to pass.